Come and experience a sense of space both in and out in Blue Cliffs Dreaming Spa Villa, where you have a safari feel and can drift gently into a sense of connectedness to the earth and the bush from a creatively designed space, while you can enjoy the passing of kangaroos, echidnas, as well as flocks of cockatoos, kookaburras, rosella and blackbirds. Relax and experience the quiet stillness of being, occasionally punctuated by birdsong. You can soak in a beautiful spa bath, feeling very much a part of your own private outdoor room, enjoy a lovely shower experience, and in winter and also for relaxing, detoxing and the warmth of inner being is your own sauna for two. Check property website for availability and rates. Features: Dreaming Spa Villa is a very restful experience, private, romantic and picturesque. It has a canopy Queen Size bed, lovely comfy couch where you can easily access your LCD Digital (12 stations) TV, DVD, CD & ipod dock along with a small selection of classic DVDs and CDs. 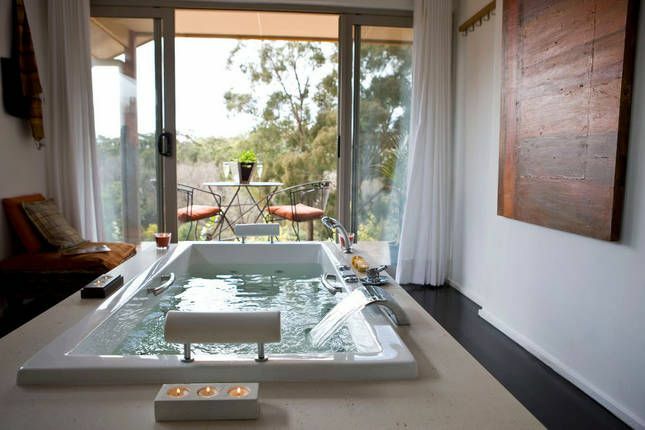 Included are a double spa bath and sauna, corner shower and day bed on the deck overlooking the creek for you to relax and watch the world go by. In addition, all linen is provided as well as complimentary BASIC EARTH (biodegradable product and container) nourishing shampoo, restoring conditioner and reviving body wash.
Our stay was incredible. The scenery was amazing and such a private location. A luxurious feel.